This tutorial describes how to update the Operating System of your BeagleBone Black to the latest supported version. This will take you through the steps to write a BeagleBone Black Operating System image onto a microSD card, boot from the SD card, and optionally install the new OS onto the BeagleBone Black eMMC (flash). 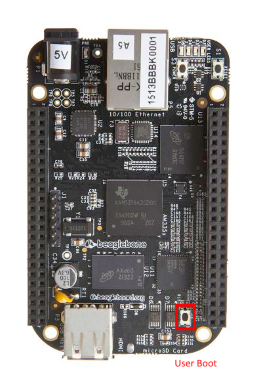 Download the latest 8.x (Jessie) BeagleBone Black image from http://beagleboard.org/latest-images. Extract the image file from the archive. Note: 7-zip is a free archive management that can be used for the step above. Place an empty microSD card into the USB adapter, and plug the adapter into a USB port on your computer. Select the device from the drop down menu that matches your microSD card to USB adapter drive. Browse to the decompressed image file and select it in the Image File path. After the write has successfully completed, eject the microSD card. Insert the SD card into your (powered-down) BBB. Hold the User Boot button down, and then plug in the power (USB or 5V adaptor). Keep holding down the button until you see the bank of 4 LED's light up for a few seconds. You can now release the button. The BBB is running from the SD card. Shutdown he BBB and disconnect power. The BeagleBone Black is reimaging the on-board eMMC (the USRx LEDs should be scrolling back and forth) and you will need to wait up to 45 minutes for the programming to complete. All four USRx LEDs will remain lit solid when the process is complete. Power on the BBB to boot from eMMC.